It's been a thoroughly exciting week for me; not only has Leicester seen the reinterment of Richard lll, but on a more personal note I've got a new oven and visited a gin distillery for the first time. I've read a bit of negative press about the Richard lll events and heartily disagree with all of it, my experience has been an overwhelmingly positive one. 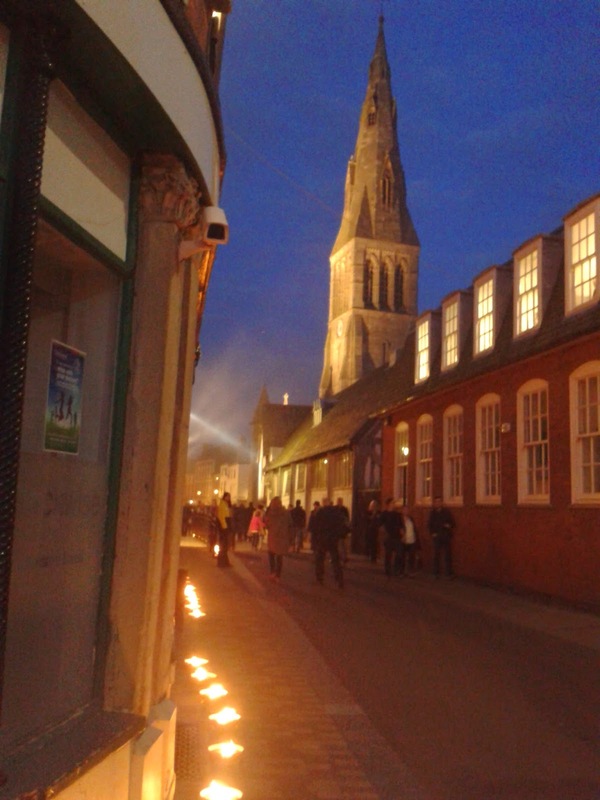 It all finished up on Friday night with a sort of festival of lights when thousands of candles were placed around the cathedral and down around jubilee square. They lined the roads, made patterns, hung in trees and on sculptural forms, smoked like crazy, and were beautiful. 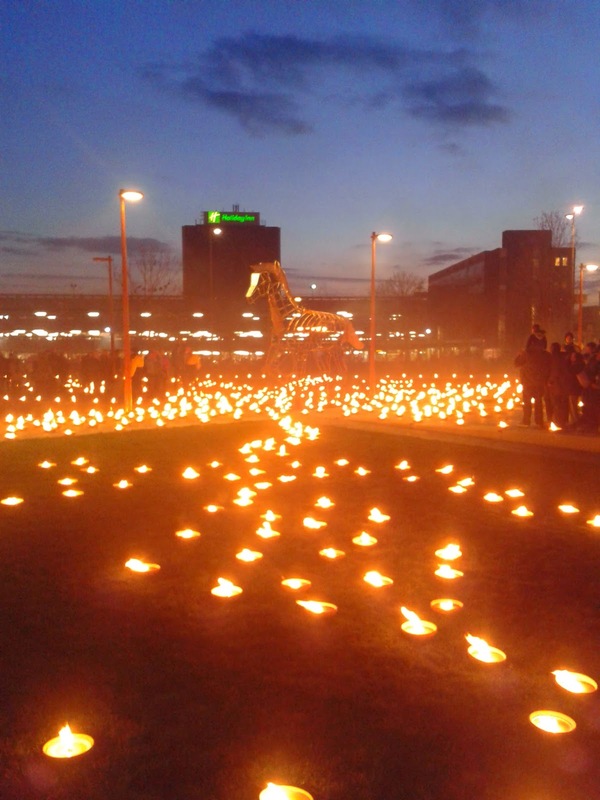 Leicester isn't a particularly large or glamorous city, it's not a bad place to live and has some great things going on, but it generally feels like it suffers in comparison to Birmingham or Nottingham. In short it is not a place I associate with civic pride, or didn't before this week. When we were trying to put our collective fingers in what made Friday night so special what we kept coming back to was optimism, that and a general feeling of excitement in having something unique to take part in. I hope that sense of optimism continues, we need it. And as for the distillery - it was Sipsmith's in Chiswick and there will be more on that soon. 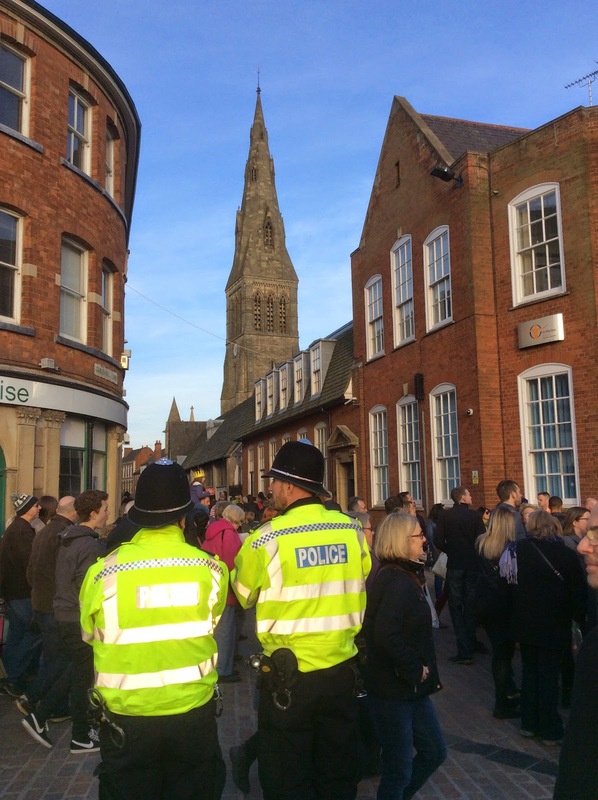 As it was all happening on my doorstep (specifically across the park opposite my doorstep) it would have been a shame to miss Richard III's funeral cortege. It was a sunny afternoon as well which certainly made it more fun. There's something timeless about a crowd, it may be that much of the action is now viewed through the lenses of other people's smart phones and iPads (believe me, it was) but the atmosphere, colour, and Morris dancers don't change so much. A brief altercation between a couple of dogs behind me only heightened the medieval atmosphere. I joined the crowd besides the holiday inn (back to it so I could ignore it) where there's a very good view of St Nicholas', Leicester's oldest surviving church and where the coffin was due to change from a hearse to horse drawn gun carriage. 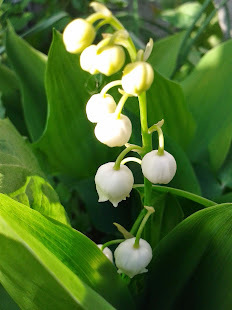 It duly did that and picked up some police horses, two Knights in armour, and a modest compliment of city dignitaries. Cutting across town to find a way home not subject to a road block I found myself on the procession route again so waited to see the coffin pass by. 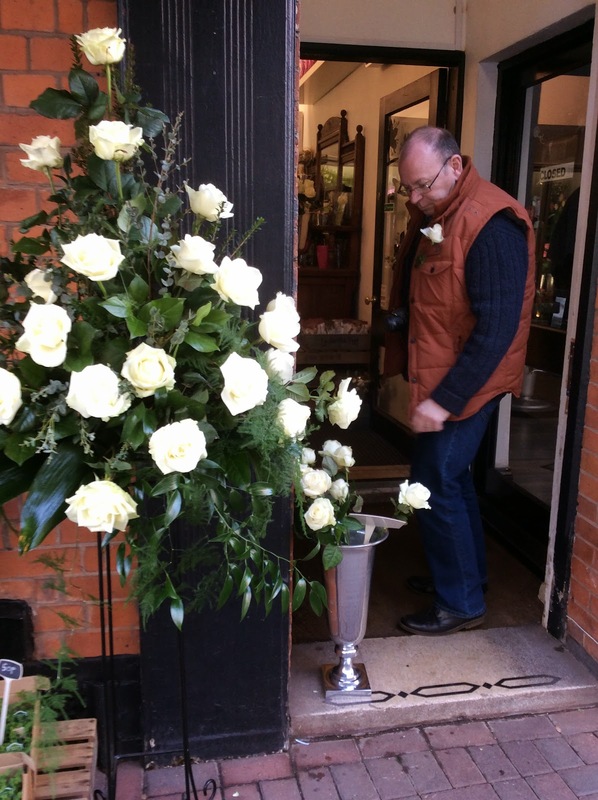 The Knights were impressive, the police horses impeccably behaved, the city dignitaries appropriately dignified, the coffin very much in view - and strewn with white roses thrown by the crowd - the crowd itself excited but surprisingly solemn, and clergy all dressed up in their finest. I'm guessing a large chunk of the budget for this has been spent on cleaning the city up (it positively sparkled) which is money well spent. There will undoubtedly have been people there for whom it was an emotional occasion, plenty watching to complain about how pointless it all was, as well as a fair few like me just interested to see what was going on - hence a decision not to waste time trying to take a lot of pictures but to see what was happening in front of me whilst it was actually happening. 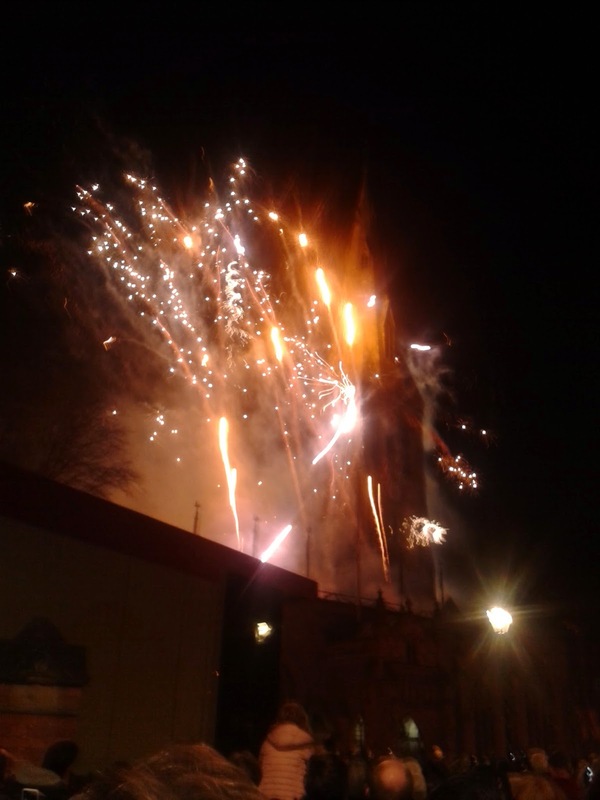 It was oddly moving, not so much because of the remains of a 500 years dead king passing by, but because it bought the city to life in a way I seldom see and enjoyed being a part of. Some of it was a bit crazy - though I'm guessing those were the people having the most fun too, generally it all seemed very well organised and as dignified as could be hoped for. And normally quiet streets crowded. March has been a strong month for cook books - I've got three crackers including 'Pigs & Pork', which I had been anticipating with some enthusiasm for a while. 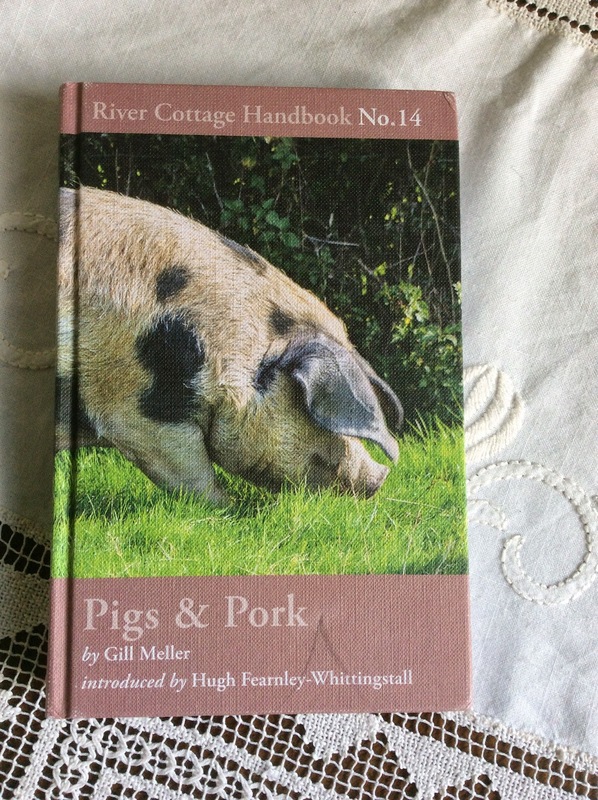 I'm a huge fan of the River Cottage handbooks, I like everything about them from design to content. Some have been more useful to me than others ('Bread' and 'Preserves' are particularly well used) living, as I do, in a Leicester City centre flat (with occasional access to a garden in which I've planted fruit trees - inspired by Mark Diacono's 'Fruit') but my windowsills abound with herbs, there are far more foraging opportunities in town than you might expect, I still have plans to cure some bacon, and there is always something useful to be found in these books. 'Pigs & Pork' is no exception. I will not be raising my own pig in the foreseeable future, mostly because of the city centre flat thing (obviously). We did do it once when I was a child; I remember it being a particularly mean spirited animal, but even so I had resolved not to eat any part of it - a resolve that lasted just as long as it took the first slices of bacon to start cooking. What I can do though is source good quality pork from local butchers and farmers markets (where it also comes in manageable portions for one person to deal with). With that in mind the advice on getting started and pig rearing are of limited use to the non pig owner - though I always find those kind of details interesting. If you like to know about what you're eating the section on choosing a breed is useful even if it's just the pork you're buying and not the actual live pig and the same goes for the how to butcher section as it's quite possible to buy a whole carcass and deal with it accordingly (though again, not necessarily practical in a small flat). Circumstances permitting that's something I'd really like to do some time with a couple of likeminded friends. There is also an excellent section on slaughter. This is important. A trip to the slaughterhouse isn't a fun day out, as Meller makes clear there will likely be an emotional response. One of the many things I like about this series is that the books don't avoid this aspect of small holding. 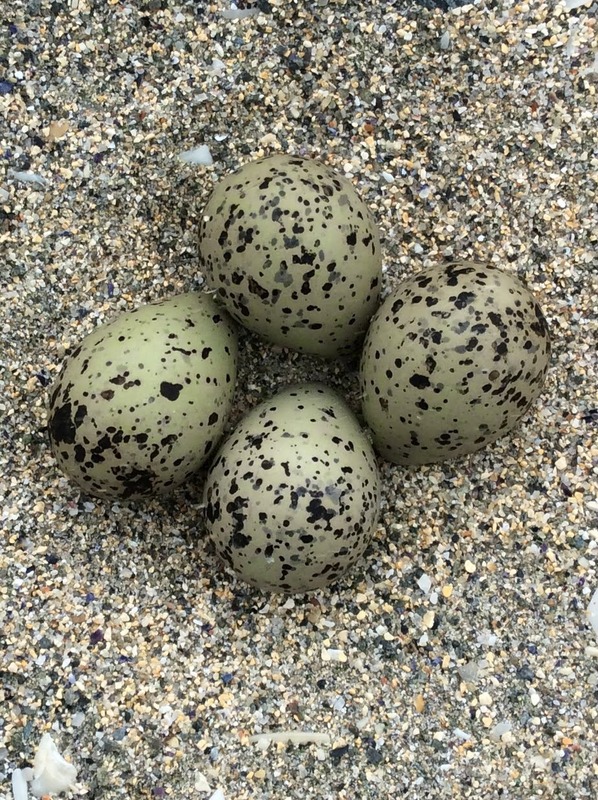 The reasonably graphic pictures make the link between animal and food clear. Something that a pre packed portion of meat does not, but it's a thing we should all be clear about. Good welfare standards matter and are worth paying for in the end product. And then it's on to the recipes which account for about half the book. The philosophy here, as you would expect, is nose to tail eating so there are recipes for ears, brains, and tail. Blood puddings, chocolate and pigs blood truffles (I'd like to try them, not sure I want to make them), every bit of offal, tongue, cheek, trotter, and then the more familiar cuts. I particularly like the look of a savoury 'chelsea bun' filled with ham, hazelnuts, and spinach (I have a new oven on the way, they could be its inaugural bake). Basically whatever bit of a pig comes your way there will be a helpful suggestion for what to do with it in here, no waste, and no nonsense. For those of us not faced with a whole pig, or any of its less obviously delicious parts the instructions for roasting, sticky ribs, pork bellies, Christmas hams and the like are more than enough to be going on with. A worthy addition to an excellent series. After enjoying the roaring girls season so much at The Swan last year my friend R and I have been planning more Stratford visits, so Wednesday night saw us brave the traffic, baffling roundabouts, significant road works, and diversions which make the journey so interesting (it's a trip designed to baffle any but the most up to date sat nav, which ours wasn't). When possible we aim to go on preview nights because they're significantly cheaper - cheap enough to make it feasible to see 3 plays over a season when at full price it might only be 1. In this case it was the very first night and the director opened proceedings by apologetically explaining his cast weren't entirely well so please to be kind to them. 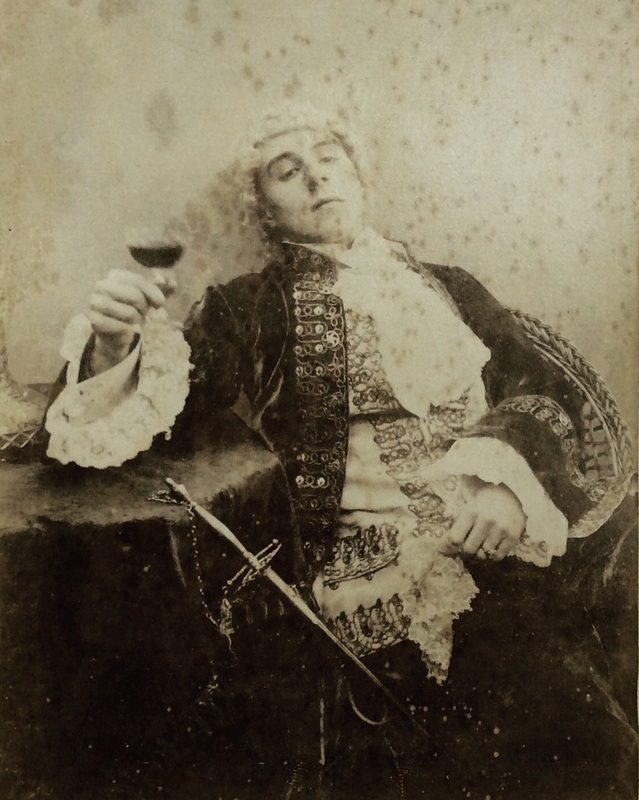 It soon became clear that Jasper Britton, playing the lead role, was very far from well which made his performance all the more impressive. I love The Swan theatre, partly because of it's size; it's small enough to feel intimate - to encourage interval conversation with neighbouring theatre goers, and to never be far from the action which often spills out through the audience. 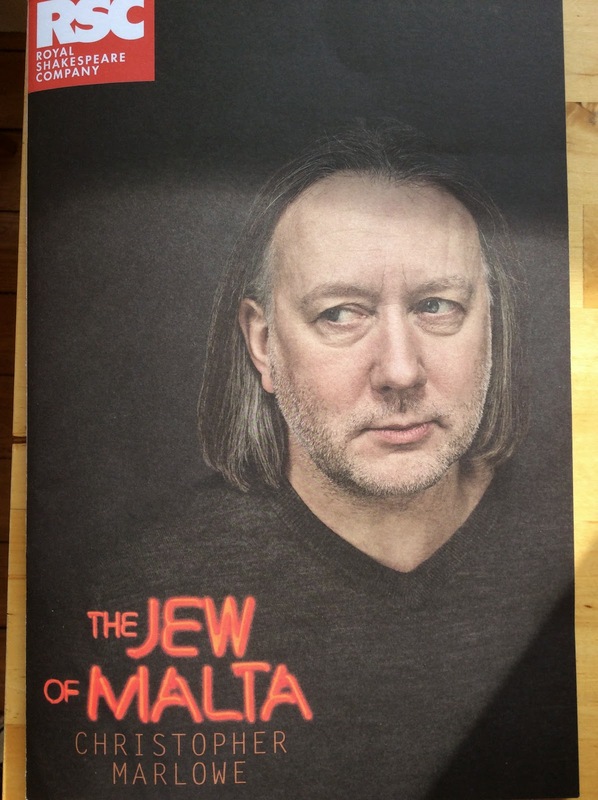 I've never been disappointed by anything I've seen there and 'The Jew of Malta' was no exception. The only Marlowe I'm at all familiar with is 'Dr Faustus' which was a highlight amongst A level set texts, though only just more dramatic than the playwrights own story. The chance to see more of his work performed was far to good to miss. In brief it turned out to be a good old fashioned blood bath. The Turks are demanding money from Ferneze the Christian governor or they'll invade. Ferneze decides to levy the cash from the Jewish population; if they don't willingly hand over half their worth then the state will seize the lot and this is what happens to Barabas who is understandably miffed and vows vengeance. He uses his daughter to help him recover some of his former assets, acquires a slave with an appetite for violent revenge to match his own, and sets the governors son against his daughters lover in a duel fatal to both. When his daughter, Abigail, realises what he's done she promptly converts to Christianity and becomes a nun. Barabas just as promptly poisons all the nuns including his daughter and then sets about disposing of the priest who heard her confession. Meanwhile his slave turned henchman is seduced by a courtesan into trying to blackmail Barabas who gets busy with the poison again. He then fakes his own death to prevent being hung before falling in with the Ottoman army and helping them sack Malta. As reward he's made governor but decides to betray them as well by plotting to kill the whole army. The previous governor who he has confided this plan to then betrays Barabas at the last minute, killing him off and regaining control of the island. There is never a dull moment. Marlowe, who seems to have been something of an atheist, satirises the myths and superstitions surrounding Jews whilst making his Christians a deeply unpleasant lot. Barabas is a monster but one it's possible to sympathise with. Ferneze is almost as monstrous and far harder to find sympathy for. T S Eliot described The Jew of Malta as tragic farce, this production chooses to play it for laughs with Barabas something of a pantomime villain at times but there is a counterbalance in the number of times he's casually, though brutally, beaten and abused for being a Jew. Barabas' excesses are stage melodrama to entertain an audience with, the reality of everyday religious intolerance is not. It's an almost ridiculously topical play which makes the decision to exploit the humour in it wise. Wednesday's audience were clearly having fun but our conversation on the way back (except whilst negotiating a particularly unexpected diversion that took us to the outskirts of Coventry) was all about the darker underlying themes so the point was obviously made. Back in the theatre we both both found ourselves thoroughly engaged by the action - edge of the seat at times and no fidgeting which really is a compliment where those hard seats are concerned. There may have been some first night hiccups but it was an excellent performance (with particularly gorgeous costumes) which I whole heartedly recommend seeing. I read Carr's 'A Month in the Country' a couple of years ago courtesy of my postal book group and promptly fell in love with it. It's thanks to the same book group that I've finally got round to reading another Carr but this one is a very different beast. Where my memories of 'A Month in the Country' are of a quiet masterpiece dealing in love and recovery of self I really have no idea what to make of 'Harpole & Foxberrow General Publishers' except that it's funny. It was the last book that Carr wrote, it was published by his own press, and appears to use the characters from his previous novels. To really appreciate it you almost certainly have to have read those novels, and as the only one I'm familiar with seems to be the one least referred to it sometimes became a bit confusing. 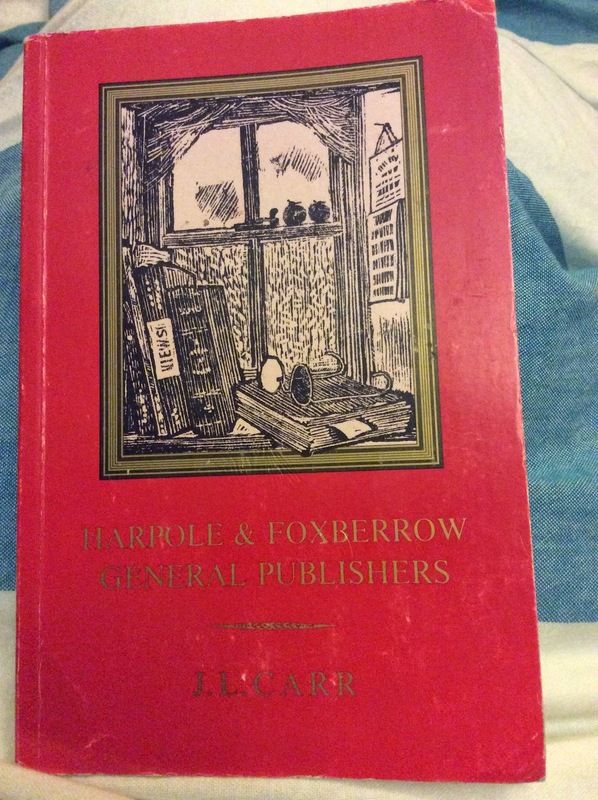 I'm assuming that what Carr wanted to do with 'Harpole and Foxberrow' was revisit old characters and have a bit of fun with them whilst sharing some of his own reminiscences about a life in publishing. Even without any knowledge of his previous work, and with no very clear plot, it was still funny enough to hook me in and make me read to the end. In a perfect world I'd have the leisure to work my way through Carr's entire back catalogue and then revisit this one to see how many more jokes I could spot and hope that all the other details might become clear too in the process. As it is I probably won't do that because time is short and my book collection feels like it's breathed out. Sometimes the shelves seem to just about contain them but not at the moment. 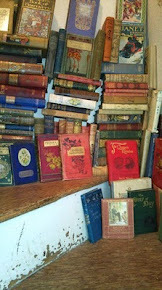 There are books everywhere; under, on, and in, everything. It's become so daunting a situation I may even stop buying them for a while - at least until I feel like the flat has metaphorically breathed in again and I have the illusion of control once more. Or the cake that really made the point that I need a new oven (I'll put it in hand on my next day off). Mother's day is as good an excuse for baking a cake as any and as mine was coming round for lunch with my sister it was also the perfect time to play with a couple of new cookbooks. Diana Henry's 'A Bird in the Hand' (chicken book) and Anne Shooter's 'Sesame & Spice' (baking) of which there will be proper reports soon. 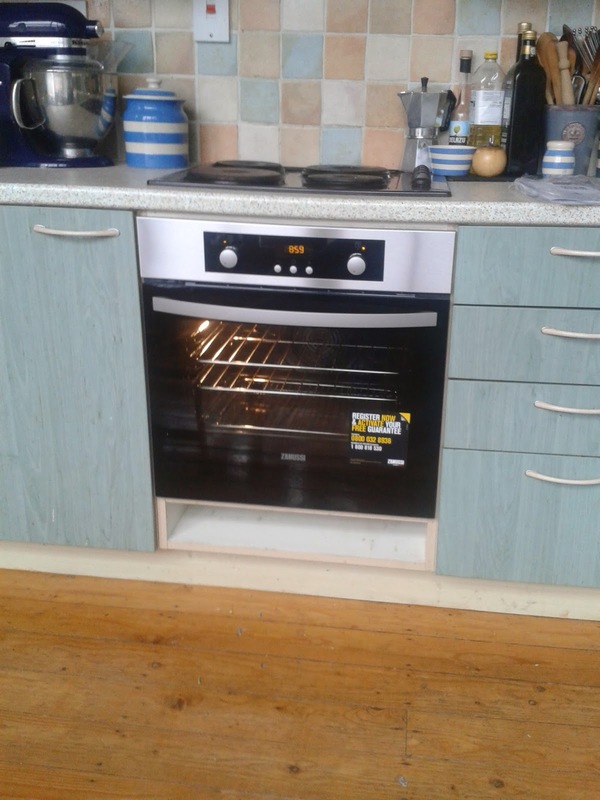 The oven has been slowly dying for a while, and though it managed to cook everything it really struggled. Especially with the cake which needed almost twice the time it should have done, refused to firm up for almost all of that time and then went very brown very quickly when I turned my back for 5 mins to lay the table. Happily by the time the chicken went in it had built up a sufficient head of steam not to take forever or poison us with undercooked meat but it's very possible I won't be so lucky next time. 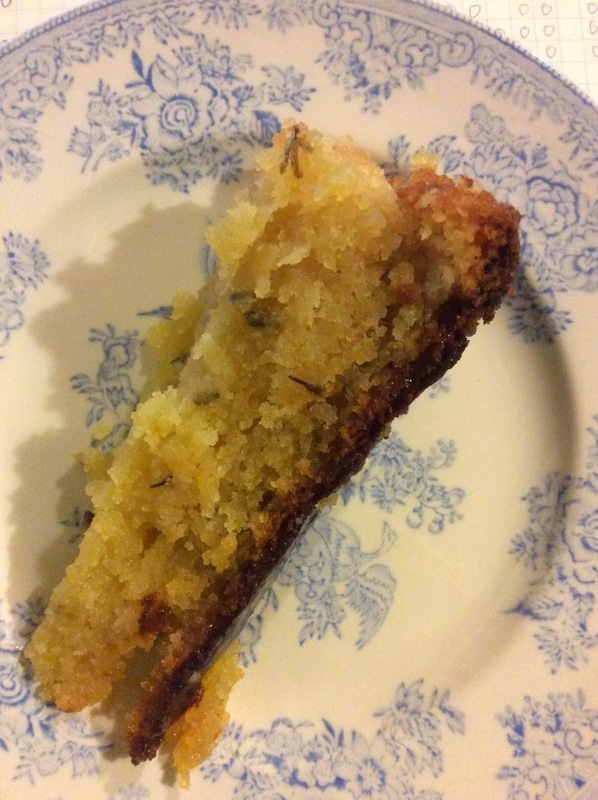 The chosen cake was Citrus lavender syrup cake and despite the vagaries of the oven it's excellent. The lavender is as subtle as the recipe promises but brings a lovely smokey something to the mix. Warm with cream it was a very acceptable pudding, cold it's gone down just as well with coffee. Heat (a working) oven to 180C/gas4, grease a 22cm tin, and line it's bottom with baking parchment. Cream together 200g of unsalted butter and 200g caster sugar until light and fluffy then slowly add 3 egg yolks mixing well between each one and then a tea spoon of vanilla extract. After that throw in the grated rind of 2 oranges and a lemon, 2 teaspoons of baking powder, 2 teaspoons of dried lavender, and 300g of ground almonds. Mix well then stir in 100g of natural yoghurt. In a seperate bowl beat the 3 egg whites until they form stiff peaks then fold them into the batter, put it in the tin and bake for 50 mins or until done. If it looks like it's going to brown on top then cover it with foil. Meanwhile make the syrup from the juice of the 2 oranges and a lemon, a further teaspoon of lavender, and 100g of caster sugar - simmer until syrupy. When the cake comes out of the oven pierce it all over and anoint with the syrup. But not empty handed. A trip north is never cheap - in this case it was the W's that got me; whisky and wool. 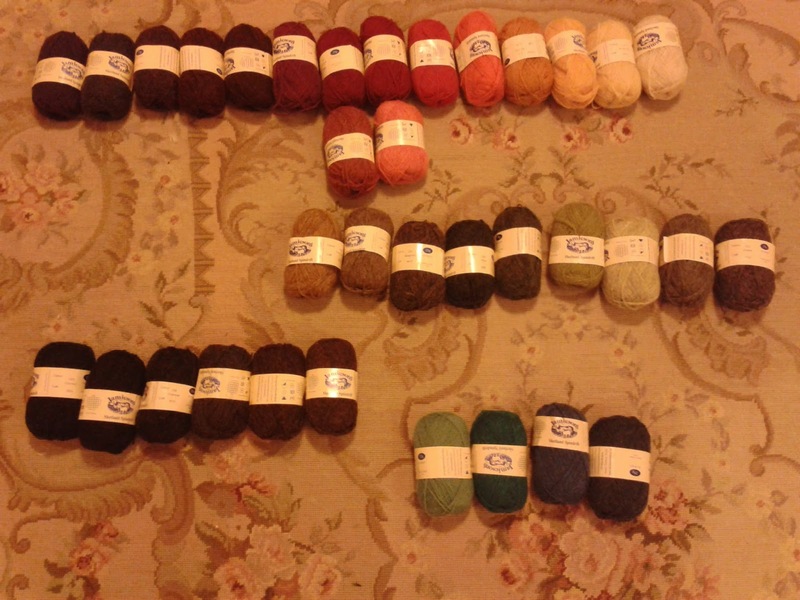 I bought 37 balls of wool for approximately the same price as a litre of Laphroaig PX, both represent excellent value. 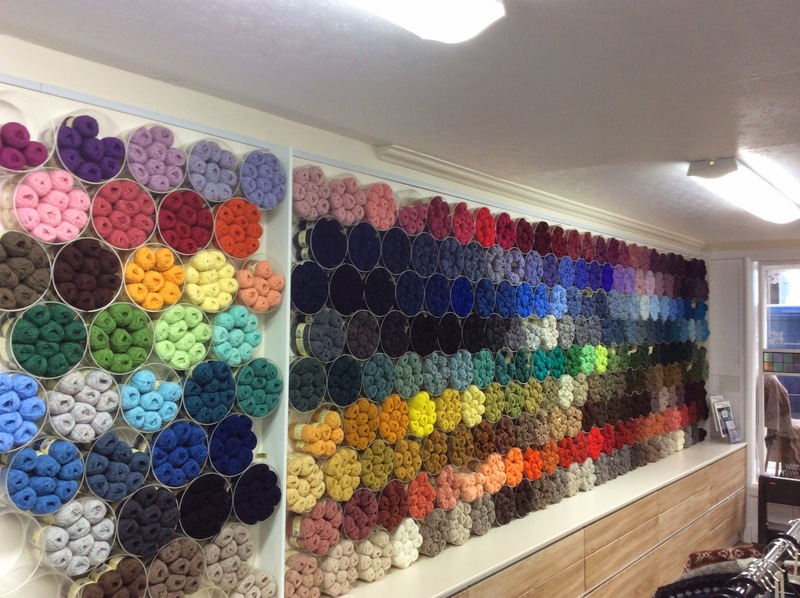 I thought I'd got a reasonable spread of colours but looking at them now I really don't think I bought enough. There's a definite need for a really yellowy yellow, more blues, something pink... Never mind, I'm going back in June and it's possible I'll struggle on somehow with what I've got. Now all I need to do is work out what to make. when an unexpected opportunity for a couple of days back home in Shetland presented itself I couldn't resist the opportunity so I'm currently sat in a window overlooking a harbour in a howling gale watching a ferry plough back and forth and couldn't be more content. It's a shame it's only a flying visit (unless the flying gale seriously affects flights out - but when are travel arrangements ever upset when you don't actually want to leave?) 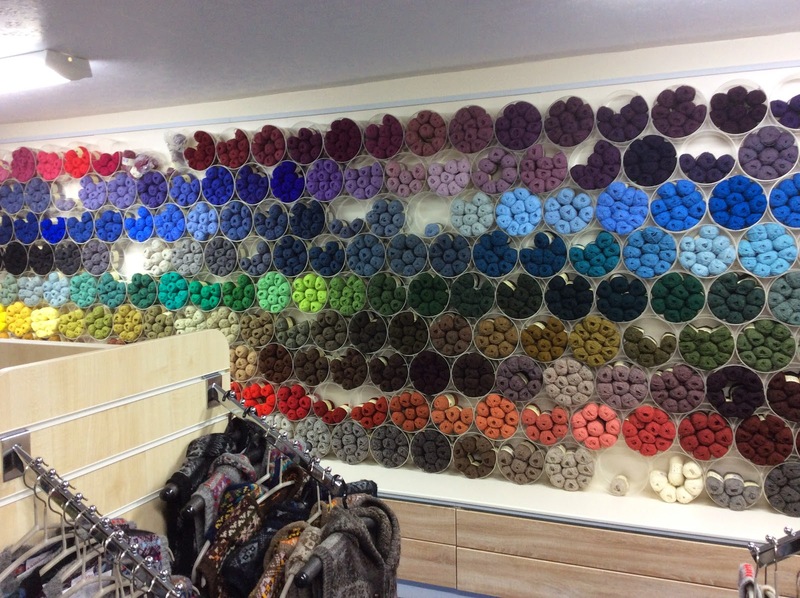 but I've had plenty of time in the local bookshop and exploring the manifold delights of my preferred wool emporium. 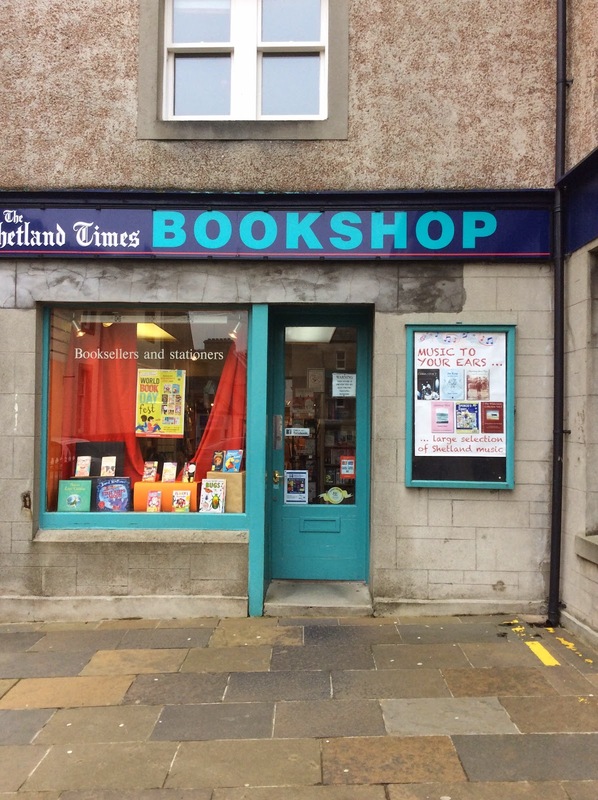 Jamieson's shop is but 50 or so yards from The Shetland Times Bookshop and their range of colours is glorious. It was choosing stuff for my sister from them last summer which made me think I should try knitting again myself so my strategy today was to basically pick up as wide a palate of colours as I could, including some I wouldn't normally look at, to have some fun with over the next couple of months. 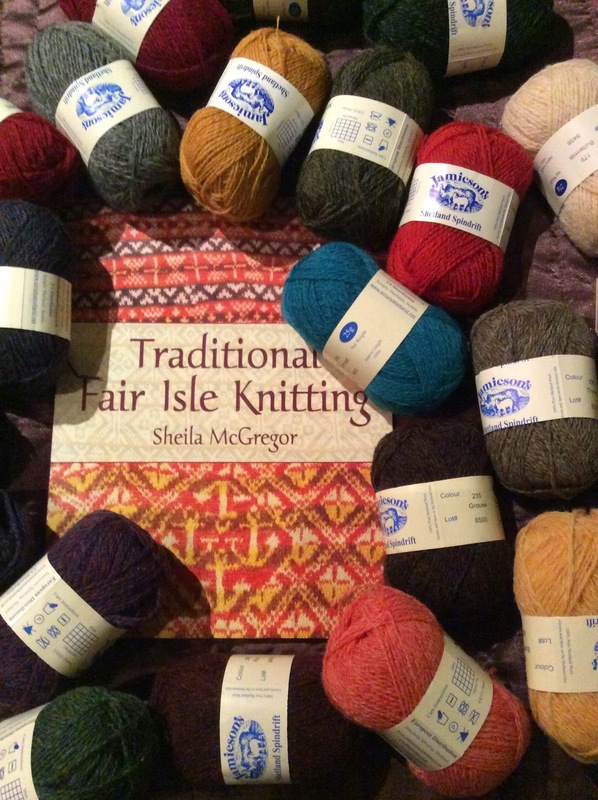 I'll be back in Shetland for a proper visit the summer when I'll choose colours with more purpose but for now it's all about having a good play. making the most of limited space with a really interesting range of books. I had no trouble finding something to suit my requirements and am only sorry not to have more time here to catch up with a few people. The knitting bug seems to be lasting, I managed a second scarf (palmed off on a friend) and then made a concerted effort over 3 days to conquer a simple chevron pattern. Tried. For 3 days. Failed. 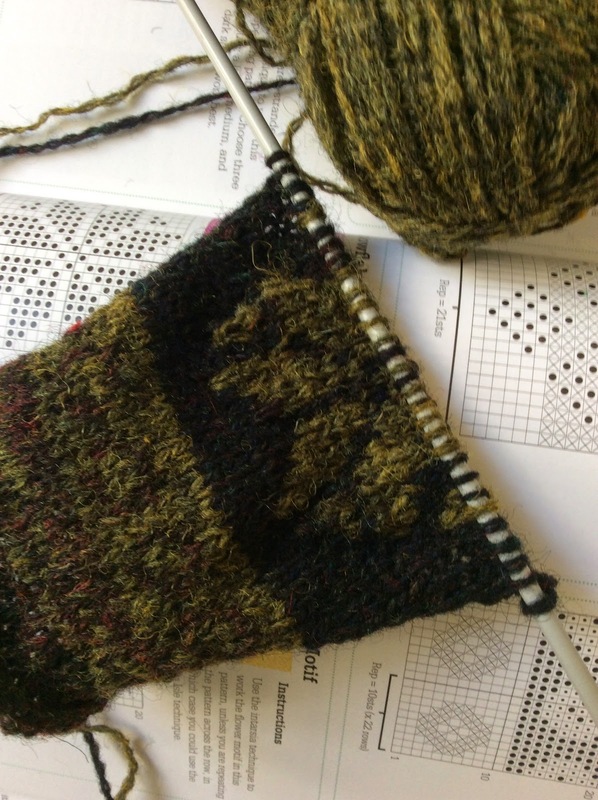 That was somewhat disheartening, but try as I might, and I really tried, I ended up with a hellish combination of dropped stitches that ran to ladders and an ever increasing number of extra stitches by the end of each row. I would have taken it better if the pattern hadn't insisted it was simple and easy. 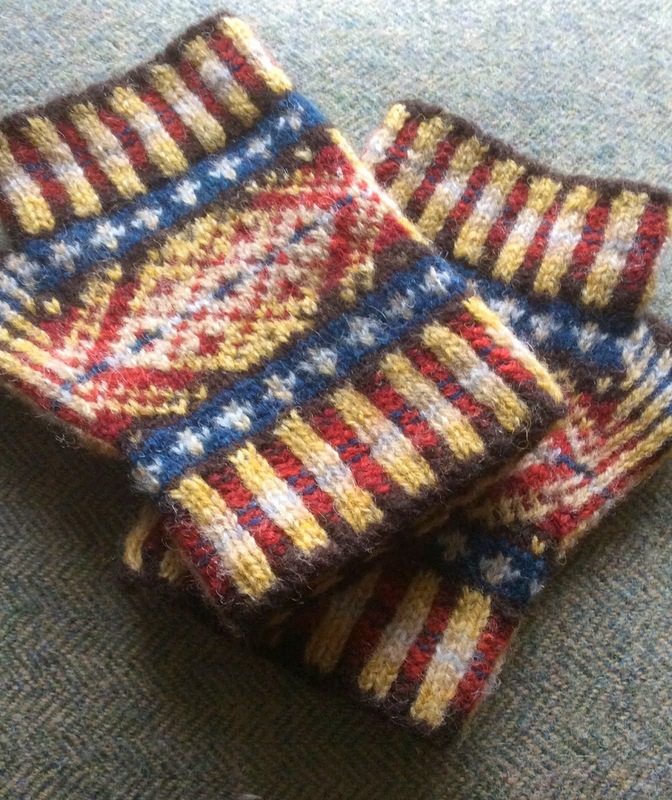 After a bit of a rethink I decided to have a go at Fair Isle - only a sample square - and that's been much more satisfactory. For a start on such a small scale it was impossible to lose where I'd got to in the pattern, and being based on colours rather than obscure instructions in all but incomprehensible abbreviations it really was simple. All entirely encouraging so this weekend I'm making it a mission to find a good collection of yarn in a suitable variety of shades and something with a good collection of fair isle designs (maybe a book of some sort...) with a view to some sort of project - possibly a cushion cover if I have the patience to finish it. 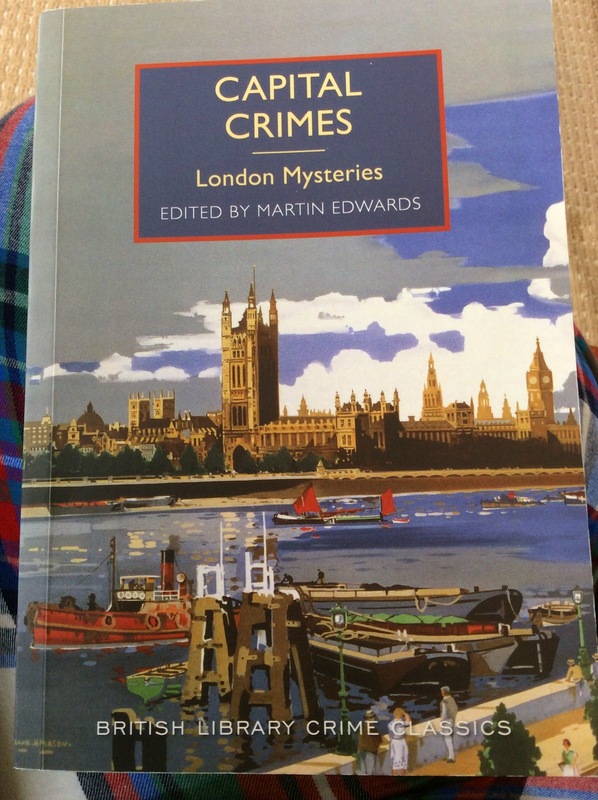 I'm a big fan of the British Library crime classics series, it's a great idea which has lived up to expectations - and who can ask for more than that? There are also times when it far exceeds expectation and this is one of them. In 'Capital Crimes' Martin Edwards, for want of a better word, curates 17 short stories of murder and murderous intent with a common theme of London as their setting. The order is roughly chronological and spread over about half a century starting with Conan Doyle in what feels like a distinctly Victorian London and ending in a post war pea souper. The golden age queens of crime (Christie and Sayers) are not specifically represented although their work and influence is discussed - but then they really don't require much introduction and one detail I really like about this book is its introductions. 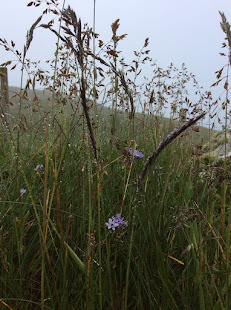 Each story is prefaced by a paragraph or two - enough to be useful without being distracting. The Conan Doyle exhibited is 'The Case of Lady Sannox', Holmes and Watson are entirely absent and the story is everything that Edwards promises - it is clever, cruel, and totally chilling, as much horror as it is crime and sets a high bar for what's to follow. Other highlights include Thomas Burke's 'The Hands of Mr Ottermole', the twist at the end might not be the greatest surprise, but the build up of suspense is masterly, also it was the wrong thing entirely to read on the bus home. The subsequent walk through town was not quite as carefree as usual. Ethel Lina White's 'Cheese' is similarly atmospheric, concentrating almost entirely on the very understandable fears of an intended victim. E. M. Delafield's contribution also takes a good look at an intended victim, but with an entirely likely lack of sympathy. A couple move into a boarding house where the outgoing attractive husband easily makes friends but his nervous and awkward wife does not. Her fears that her husband wants to do away with her only alienate her neighbours - but what if she's right? H.C. Bailey's 'The Little House' is chilling for different reasons, the details may set it sometime in the 1920's but the bones of the story could appear in any current crime drama. After that the ingenious problem solving elements of Margery Allingham's 'The Unseen Door' or Anthony Berkeley's 'The Avenging Chance' are a positive relief. Altogether it's an extremely satisfying collection which has unearthed plenty of obscure gems along with its better known contributors. Apart from that dark walk home I've enjoyed every moment of it.